Baby wipes are a fixture on most changing tables, and when used appropriately, most baby wipes are a safe and hygienic product. Because they are sold in sealed plastic packages and are not reused, baby wipes can play a role in keeping your baby clean and getting rid of harmful bacteria. However, there are some risks associated with baby wipes and their accessories. One key to using baby wipes safely is to know their uses and limitations. The main ingredient in most baby wipes is alcohol, accompanied by artificial fragrances and other chemicals that keep the wipes from mildewing. While alcohol does have some antibacterial properties, baby wipes won't kill all bacteria or viruses. Do not use baby wipes in place of cleaning products to sterilize the changing table or your hands. Never allow a baby to take a baby wipe from you. A baby's natural instinct is to put the wipe in her mouth. Because the wipes are small enough to fit in your baby's mouth, they present a choking hazard. In addition, the alcohol and chemicals on the wipes aren't meant for internal use and they can make your baby ill. Place the baby wipes out of reach at all times. 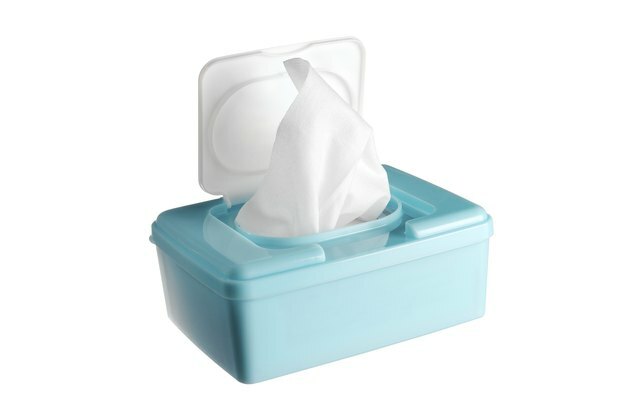 In 2010 and 2011, some brands of baby wipes were recalled because they were contaminated with harmful bacteria. You don't need to worry that all wipes are potentially hazardous, because most are safe and manufactured under very hygienic conditions. However, you should monitor the news and check the Consumer Product Safety Commission website periodically for recalls on wipes and other baby products. If your wipes are recalled, dispose of them immediately as directed by the Consumer Product Safety Commission. Baby wipe warmers are convenient for late-night diaper changes because they keep the wipes warm, which is less startling for a drowsy baby. However, many experts recommend that you do not use them. Some wipe warmers have been recalled because of problems with the fluid from the wipes leaking into the warming chamber, which can cause serious shocks or even electrical fires. In addition, some wipe warmers dry out your wipes, making them less useful. National Capital Poison Center: Are Diaper Rash Products Dangerous?